Presenting another interesting addition to the Ben 10 Series – Ben 10 Hero Hoops. It is very different from all the games of Ben 10 which you have already played. In simple words, it is a must play game for those who love to play basketball and are fans of Ben 10. Are you guys ready to help Ben to aim towards the basket and score points? Wait, do check out the gameplay below for some tips! In Ben 10 Hero Hoops, you have to help Ben perfect his jump Shot. You have to Shoot the Red Rubber Balls inside the moving hoop. The time is limited, score as many baskets as you can. Now it’s up to you either you can help Ben in winning the game or make yourself out of the Basket Ball Court. Pro Tip: Don’t forget to hit the Bonus Baskets which will appear throughout the game. 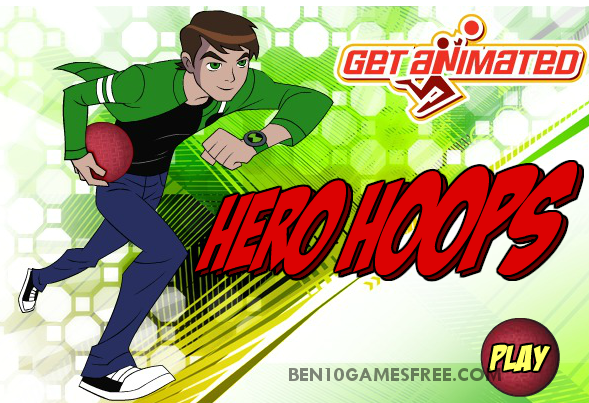 Ben 10 Hero Hoops is a game of time in which you have to aim the Red Rubber Ball inside the moving Baskets. You have to aim the basket properly before letting it go from your hands. You have to be very much sure of your target before you aim it. Recommended: Play Ben 10 Duel of Duplicates Game online for free now! The aiming Hoops in the Game continuously moving from left to right and Right to left. The aiming hoops are of different colors and every color represents different points in the point table. In between the game you will find Bonus Hoops come along the way for the target, don’t miss them, they help you to score big. You have to reach to the ball to pick it everytime you throw it. So give a player a perfect position after hitting the aim. Get Ready to show your Basket Ball skills in this one of it’s kind Bane 10 Game! Don’t Forget to give your rating for Ben 10 Hero Hoops Ben 10 Hero Hoops game and share your tips and tricks to win this game in the comments section below.